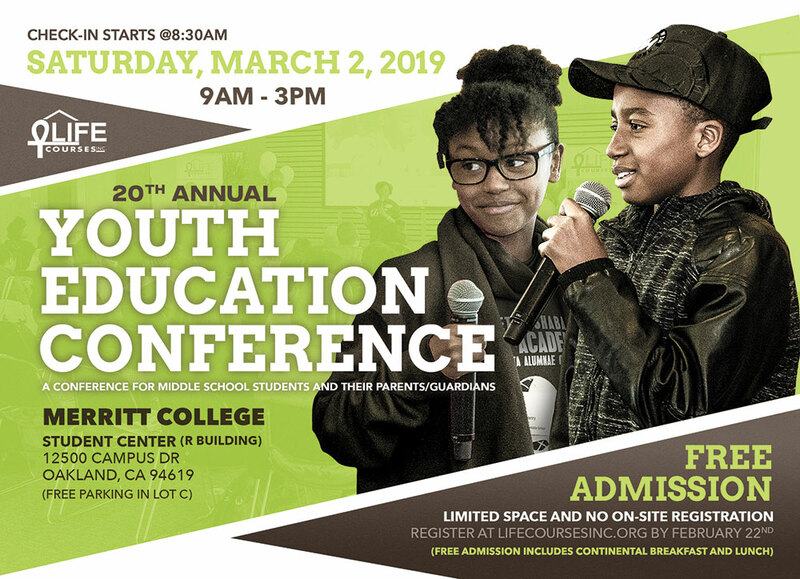 Welcome to our 20th Annual "Youth Education Conference" (YEC) event registration page. YEC is LIFE Courses' flagship event. The theme of this year's Conference is "Inspiring Young Entrepreneurs". The YEC is a FREE, one day workshop for middle school students and their parents/guardians. Breakfast and Lunch are provided to all attendees. Completion of this Registration Form is Required﻿ for all attendees (students, parents and volunteers). If you have questions, please email info@lifecoursesinc.org. LIFE Courses, Inc. is released from any liabilities associated with all attendees participation in this event. If you've attended an event in the past, please use the same email. Please select... Adelanto Alameda Albany American Canyon Antioch Apple Valley Atherton Barstow Belmont Belvedere Benicia Berkeley Big Bear Lake Brentwood Brisbane Burlingame Calistoga Campbell Capitola Carlsbad Chino Chino Hills Chula Vista Citrus Heights Clayton Cloverdale Colma Colton Concord Coronado Corte Madera Cotati Cupertino Daly City Danville Davis Del Mar Dixon Dublin East Palo Alto El Cajon El Cerrito Elk Grove Emeryville Encinitas Escalon Escondido Fairfax Fairfield Folsom Fontana Foster City Fremont Galt Gilroy Grand Terrace Grass Valley Half Moon Bay Hayward Healdsburg Hercules Hesperia Highland Hillsborough Hollister Imperial Beach Isleton La Mesa Lafayette Larkspur Lathrop Lemon Grove Live Oak Livermore Lodi Loma Linda Los Altos Los Altos Hills Los Gatos Manteca Martinez Menlo Park Mill Valley Millbrae Milpitas Montclair Monte Sereno Moraga Morgan Hill Mountain View Napa National City Needles Nevada City Newark Novato Oakland Oakley Oceanside Ontario Orinda Pacifica Palo Alto Petaluma Piedmont Pinole Pittsburg Pleasant Hill Pleasanton Portola Valley Poway Rancho Cordova Rancho Cucamonga Redlands Redwood City Rialto Richmond Rio Vista Ripon Rohnert Park Ross Sacramento San Anselmo San Bernardino San Bruno San Carlos San Diego San Francisco San Jose San Juan Bautista San Leandro San Marcos San Mateo San Pablo San Rafael San Ramon Santa Clara Santa Cruz Santa Rosa Santee Saratoga Sausalito Scotts Valley Sebastopol Solana Beach Sonoma South San Francisco St. Helena Stockton Suisun City Sunnyvale Tiburon Tracy Travis Air Force Base Truckee Twentynine Palms Union City Upland Vacaville Vallejo Victorville Vista Walnut Creek Watsonville West Sacramento Windsor Winters Woodland Woodside Yountville Yuba City Yucaipa Yucca Valley Other If your city isn't on this list - scroll down to "other"
Please include some information to help us match the household member! The email of the household member who previously attended. Please select... Academy of Alameda Acts Christian Academy Alameda Science and Technology Institute Albany Middle School Alice Fong Yu School Alliance Academy Alt Academy Amador School American Canyon Middle School American Indian Charter School Animo Westside Charter Middle School ANN'S Academy ANN's Educational Services Anna Yates Elementary School Anthony Ochoa middle school Antioch Charter Academy Antioch High School Aptos Middle School Archway School Assumption School Athenian Middle School B. Gale Wilson School Bancroft Middle School Banta School Bay Area Technology School Bay Farm Elementary School Beacon Day School Bellarmine College Preparatory Benicia Middle School Benjamin Franklin Middle School Benjamin Holt College Preparatory Bentley School Berkeley High School Berkeley Maynard Academy Bishop O'Dowd High School Black Diamond Middle School Black Pine Circle School Bret Harte Middle School Bristow Middle School Buckingham Charter Magnet High School Burbank Elementary School Caliber: ChangeMakers Academy Calvary Baptist Christian Academy Canyon Middle School Carondelet High School Carquinez Middle School CAVA - Hercules (California Virtual Academies) Home school CAVA - Oakland (California Virtual Academies) Home school CAVA - San Joaquin (California Virtual Academies) Home School Cesar Chavez Middle School Center Elementary School Centerville Junior High Chinese Christian Schools City College of SF Claire Lilienthal School Claremont Middle School Clayton Valley Charter High School Coliseum College Prep Academy (Roots) College Preparatory School Contra Costa School of Performing Arts Cordelia Hills School Cornerstone Christian Academy COVA Conservatory of Vocal & Instruments Arts School Creekside Middle School Crocker Highlands Elementary School Crystal Middle School D. W. Babcock Elementary School Dallas Ranch Middle School David Weir K-8 Preparatory Academy De La Salle Academy Deer Valley High School Del Mar Middle School Dublin High School E.C. Reems Academy of Technology & Art Earle Williams Middle school East Bay Innovation Academy East Bay School For Boys Ecole Bilingue de Berkeley School Edendale Middle School Edna Brewer Middle School Edison-Bethune Charter Academy Edison Computech Edward Harris Middle School El Camino High School El Cerrito High School Elizabeth Stewart K-8 Elementary School Emery Secondary School Epic Middle School Excelsior Middle School Explore School Fallon Middle School Fairfield High School Franklin High School Franklin Middle School Gale Ranch Middle School George Y. Komure Elementary School (Stockton) Glen Park Middle School Golden Gate University Golden State College Prep Academy - Aspire Golden West Middle School Grange Middle School Grant School Green Elementary School Green Valley Middle School Hamiln School Hayward Community Day School Hayward High School Head-Royce School Hearst Elementary School Hercules Middle/High School Hilltop Christian School Hillview Junior High School Hillview Middle School Homeschooling Ile Omode School Iron House Elementary School Itliong Vera Cruz Middle School John G. Mattos Elementary School John Green Elementary School John Muir Elementary School John Muir Middle School John Swett High School Joseph H. Wardlaw Elementary School Juan Crespi Middle School Julia Morgan School for Girls Kairos Charter School Kairos Public School Vacaville Academy King Estates Middle School KIPP Bridge Academy KIPP King Collegiate High School KIPP San Francisco Bay Academy Kipp San Francisco College Prep KIPP Summit Academy Koramatsu Middle School Lavonya Dejean Middle School Lincoln High School Lincoln Middle School Lodestar - A Lighthouse Community Charter School Lodestar, A Lighthouse Community Public School (Oakland) Longfellow Middle School Loria Williams-Bridges School Lorin A. Eden Elementary School Manzanita Middle Charter School Marin Academy Marina Middle School Martin Luther King Jr, Junior High School - Pittsburg Martin Luther King Jr Middle School - Hayward Martin Luther King Middle School - Berkeley McClymonds High School McKinley Highschool Melrose Leadership Academy Millsmont Academy Secondary School Mira Vista School Mission Dolores Academy Mitchel Middle School Montera Middle school Monte Vista Middle School (Tracy, CA) Mt Eden High School (Hayward) Muhammad University - Hayward Muhammad University - Oakland Murphy Middle School Natomas Charter School North Hills Christian School North Oakland Community Charter Northern Light School O'Hara Park Middle School Oakland Charter High School Oakland High School Oakland Military Institute Oakland School for the Arts Oakland SOL (School of Language) Dual Language Middle Oakland Technical High School Oakland Unity High School Oak Park Preparatory Academy Olinda Elementary School Orchard Park School Orinda Academy Orinda Intermediate School Our Lady of Grace School Our Savior Lutheran School Palmer School Parkway Heights Middle School Piedmont Avenue Elementary School Pinole Middle School The Phillips Academy Pleasanton Middle School Portola Middle School Prospect Sierra School Quarry Lane School (Dublin) Ralston Middle School Rancho Medanos Junior High School Realm Charter School Redwood Christian Elementary School Redwood Day School Redwood Heights Elementary School Roosevelt Elementary School Roosevelt Middle School Rosa Parks Elementary School Roses in Concrete Ruus Elementary School (Hayward) Saint Leo the Great School Saint Mary's College High School Salesian High School Sam Brannan Middle School Sankofa Academy Oakland San Francisco Community Alternative School San Lorenzo High School San Mateo High School Saint Leo the Great Catholic Church Santa Catalina School Sequoia Elementary School - Fremont Sequoia Elementary School - Oakland Sequoia High School Silver Oak High Montessori School Skyline High School Southgate Elementary School Spectrum Center (Frick) School St. Basil's School St. Brigid School St David School St. Isidore School St. Jerome Catholic School St. John the Baptist School St. Joseph Notre Dame High School St. Pauls Episcopal School St Elizabeth Elementary School St Ignatius College Preparatory School St John's School (Elementary) St. Leander School Stonebrae Elementary School Stoneman Elementary School Summit Public School: Tamalpais Synergy Charter School Tabernacle School Tara Hills School Terman Middle School The Berkeley School The Branson School The Hamlin School Travis Elementary School Treeview Elementary School Urban Promise Academy Valhalla Elementary School Vallejo High School Vallejo Middle School Valley View Charter Prep Vanden High School Vista Christian School Vista High School Walnut Creek Christian Academy Walnut Creek Intermediate School Washington Manor Middle School Wells Middle School Westlake Middle School West Oakland Middle School Willard Jr. High School Willie Brown Academy Wilson C. Riles Middle School Windemere Ranch Middle School Winton Middle School Woodlake Elementary School Zion Lutherean School Other If your school isn't on the list, please select "Other"
Does the Student receive free or reduced lunch at school? Please select... Adelanto Alameda Albany American Canyon Antioch Apple Valley Atherton Barstow Belmont Belvedere Benicia Berkeley Big Bear Lake Brentwood Brisbane Burlingame Calistoga Campbell Capitola Carlsbad Chino Chino Hills Chula Vista Citrus Heights Clayton Cloverdale Colma Colton Concord Coronado Corte Madera Cotati Cupertino Daly City Danville Davis Del Mar Dixon Dublin East Palo Alto El Cajon El Cerrito Elk Grove Emeryville Encinitas Escalon Escondido Fairfax Fairfield Folsom Fontana Foster City Fremont Galt Gilroy Grand Terrace Grass Valley Half Moon Bay Hayward Healdsburg Hercules Hesperia Highland Hillsborough Hollister Imperial Beach Isleton La Mesa Lafayette Larkspur Lathrop Lemon Grove Live Oak Livermore Lodi Loma Linda Los Altos Los Altos Hills Los Gatos Manteca Martinez Menlo Park Mill Valley Millbrae Milpitas Montclair Monte Sereno Moraga Morgan Hill Mountain View Napa National City Needles Nevada City Newark Novato Oakland Oakley Oceanside Ontario Orinda Pacifica Palo Alto Petaluma Piedmont Pinole Pittsburg Pleasant Hill Pleasanton Portola Valley Poway Rancho Cordova Rancho Cucamonga Redlands Redwood City Rialto Richmond Rio Vista Ripon Rohnert Park Ross Sacramento San Anselmo San Bernardino San Bruno San Carlos San Diego San Francisco San Jose San Juan Bautista San Leandro San Marcos San Mateo San Pablo San Rafael San Ramon Santa Clara Santa Cruz Santa Rosa Santee Saratoga Sausalito Scotts Valley Sebastopol Solana Beach Sonoma South San Francisco St. Helena Stockton Suisun City Sunnyvale Tiburon Tracy Travis Air Force Base Truckee Twentynine Palms Union City Upland Vacaville Vallejo Victorville Vista Walnut Creek Watsonville West Sacramento Windsor Winters Woodland Woodside Yountville Yuba City Yucaipa Yucca Valley Other If the city isn't on this list - scroll down to "other"
Please enter the student's birthdate. The student needs to be between 8 - 19 years old. Does the Student have any food allergies? What is Adult's relationship to the Student? Is the Adult & the Student in the same household? Student has attended a LIFE Courses, Inc. event in the past Student hasn't attended a LIFE Courses event, but someone in their household has. Student hasn't attended a LIFE courses event before. Does the Student currently have a bank account? Did the Student open a Bank of the West bank account as a result of their previous participation in a LIFE event? If you are done registering students, click "Submit"
What is the name of the school you currently attend? What is your highest level of education you have completed? Where is your employer located? Which of the following categories describes your primary area of employment? Are you volunteering as part of an organization or group? What is the organization/group's name? What city is the organization/group in? What volunteers skills do you have?